Hello Maureen, Thank you for your support. The grave of Little Nellie is located in the nun’s plot on the NAMA owned Good Shepherd order’s former lands. The women’s graves (the one I am working on) are in a separate section behind the Gaol. The separation of the two graveyard’s shows a bias. 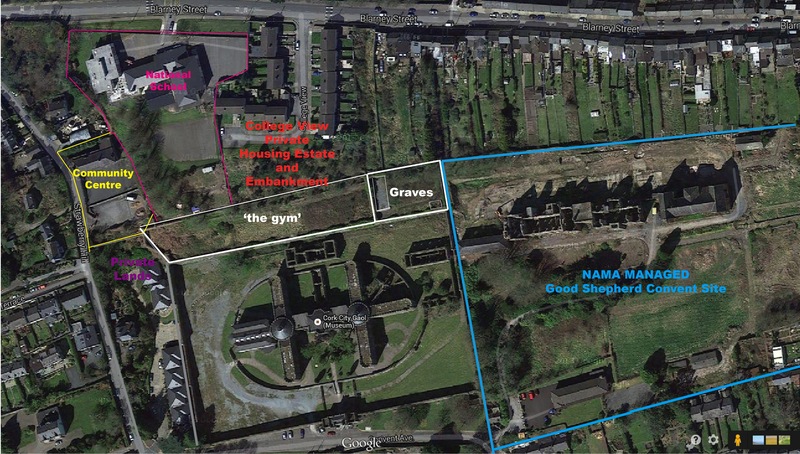 The nun’s graves (and Little Nellie’s) are located up high on the far right of the NAMA owned Good Shepherd order’s former site. If you have a good relationship with the religious then the easiest way to access Little Nellie’s grave would be to ask the nuns to allow you in and it would be safer for you. They would be able to bring you up their road to the site. The trespassing route would mean some climbing over ditches and crawling under fences. Does this help? Hello Neil, the site of the Good Shepherd institutions is now going through the planning process for redevelopment. This has been well covered by local broadcast and print news if you want to look it up. For the love of Christ. Twould make more sense to visit the Magdalene grave. No, I cannot help you with this. I campaign for access to the graves of women and children who were held in the Good Shepherd institutions. You might consider researching Irelands Magdalene Laundries and Industrial Schools if you want to understand the issue. It seems to me that Christian’s striving for access to Ellen Organ’s grave should extend those demands to all of our dead. No woman or child should be denied remembrance. Ultimately Ellen Organ’s descendants are the people who should decide what happens in regard to her burial plot. The poor sap, he has no idea what he’s talking about. Why on earth is he so hooked up on Ellen Organ I wonder? Hello Maureen thanks for your help I reckon the best entry would be college view road and try that entrance. I phoned the nuns in Good Shepherd Services but all I got was to come to them instead which is not what I was looking for. As I said I am determined to pay a visit as a remark of respect of those whose remains lie unaccessed. Thanks for taking the time to reply and very much appreciate it. I do hope that you will be successful in accomplishing this very worthy cause of our sisters who should be honoured with love and respect..
Hi Maureen, I don’t think that ground does belong to the catholic church, as far as I’m aware it is NAMA owned, although I don’t suppose they will be any more sympathetic than Jennifer will be. You could try the City Council and see if they can help you. Good luck with your treatment. Hi Rose just to say thanks but I will try my secret weapon if it works will let you know. As I said I’m determined to get to the grave and hopefully it will happen. Will keep you informed of any progress. Keep up the good fight. It’s so important, they should be honoured and never forgotten. Hello Maureen, I am curious to know how you got on with your visit to see Little Nellies grave? I have a real desire to visit her resting place. I hope all is good for you regarding your health. Hi Maura, Its really not possible to visit Nellie Organ’s grave at the moment. Nellie Organ is buried with the Good Shepherd nuns on NAMA-owned former Good Shepherd lands. I only managed to get onto the site by climbing under and over fencing but that was 2 years ago.